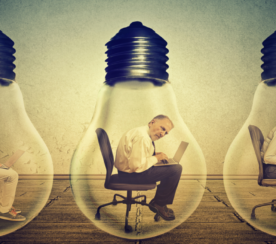 The only constant in search advertising is change. The loss of right side ads. More and much larger ads above the organic search results. Exciting new ad targeting options. And so much more. With that in mind, and in honor of our recent Grader milestones – the Grader has now been run over 1 MILLION times! – I set out to look at fresh data to get a sense for what if anything is changing regarding the overall AdWords ecosystem. Back in late 2013, we did a similar analysis and found that small businesses were leaving a lot of opportunities (and money) on the table, by committing fatal errors like low account activity and failing to optimize for mobile search. So – have things gotten better, or worse? 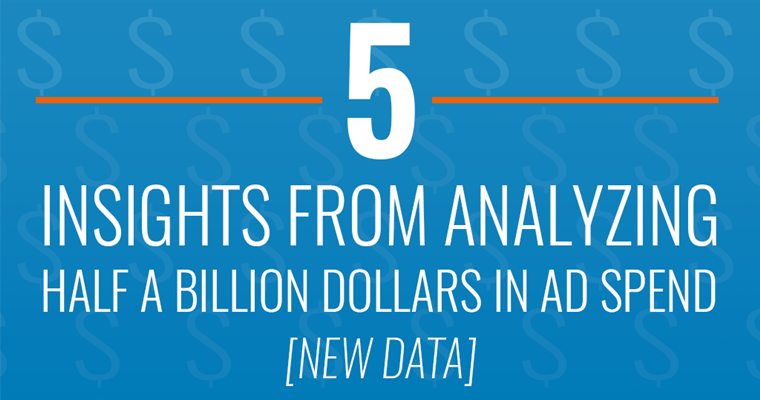 Let’s take a look at the updated AdWords advertising statistics. A quick note on the ad data sources: I looked at 30,000 reports from advertisers who ran WordStream’s AdWords Performance Grader for the first time in the last six months. I focused on small and medium-sized businesses with average spend between $10 and $5000 per month, with accounts worldwide. Since my analysis in 2013, impression-weighted Quality Scores are up! As of 2016, the average impression-weighted Quality Score for SMB’s is around 6.5. What does it mean? Has everyone gotten better at creating unicorn ads? Not necessarily. It’s not that there are fewer low Quality Score keywords out there. There are plenty of donkey keywords with Quality Scores of 1, 2, 3 and 4. But these irrelevant, low-QS keywords are now less likely to ever get impressed to a user. What’s happening here is that with the rise in mobile search and the loss of right side ads, there are fewer ad spots overall, so Google has to be pickier regarding deciding which ads to show. Not surprisingly, they are increasingly preferring to run higher-quality ads over donkey ads. 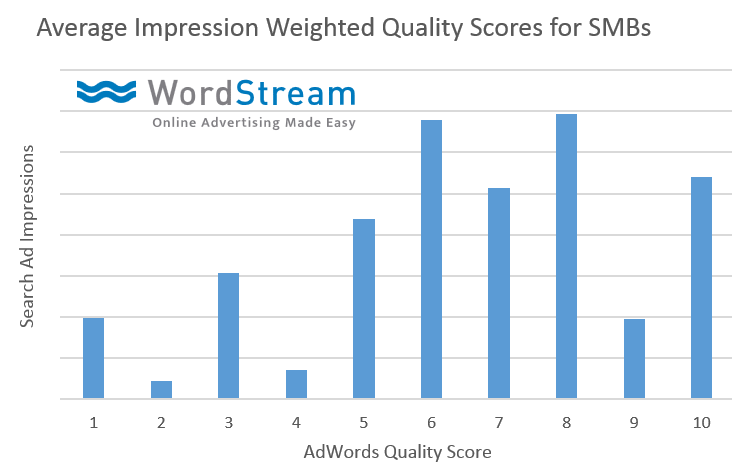 Since low-QS keywords don’t even earn impressions now, the average impression-weighted Quality Score is up overall. Key Takeaway: CTR (the biggest component of Quality Score) matters more than ever, and continues to trend up. If your keywords have very low Quality Scores (1-4) they’re just not as likely to ever be seen – as though you’re not even running an ad campaign to begin wit, so why bother setting them up in the first place? 2. 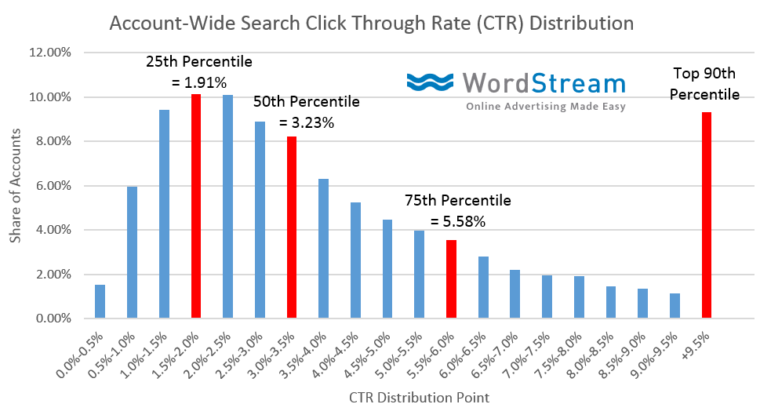 About Those CTRs – What’s a Good Click-Through Rate in 2016? 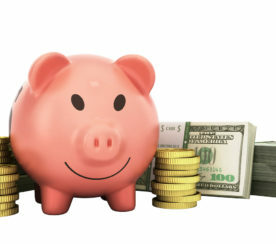 CTRs this year are trending higher than ever. 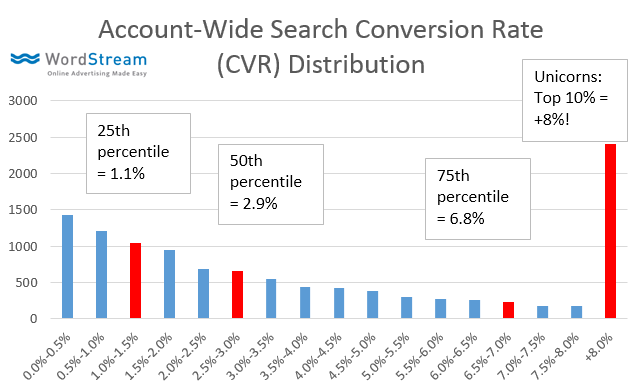 When I look at account-wide CTRs (average click-through rate for search) the average SMB account ad CTR across all positions is 3.23%. We’ve been tracking this number for a while, and that is up from 2.7% just a year earlier. That’s a big change! AdWords is less likely to run crappy ads (with low CTR and low QS) in the first place, raising average account CTRs. Bigger, more prominent ads (AKA Expanded Text Ads) are more likely to be clicked on. Our internal tests have shown that moving to ETA’s can increase CTR by up to 400%! One thing to point out here is that there’s tremendous leverage in ad text optimization. The top 10% of accounts (the unicorns) are doing more than three times better than everyone else (the donkeys). How? Unicorn ads. The AdWords auction is increasingly likely to favor high Quality Score ads. Low-CTR ads aren’t showing up as much as before. QS is a relative measure based on how your CTR compares with other ads in similar spots, devices, location, etc. CTRs across the board are going up. Which means: You’re going to have to raise your CTR just to keep your current spots, and raise it even more to get ahead. How? One of the biggest missed opportunities (regarding big impact for little effort) that my research uncovered was a chronic underuse of negative keywords. People aren’t using them as much as they should. 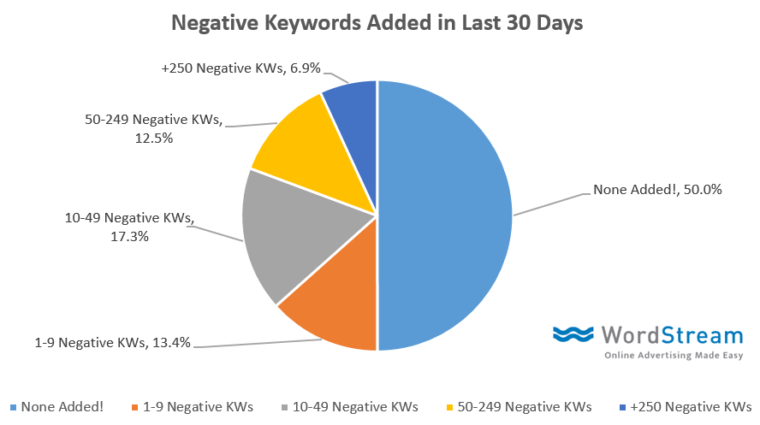 Half of the accounts didn’t add a single negative keyword in the last month. That’s a lot of wasted money. Now, Google says Negative Keywords don’t impact QS (because it’s calculated based on exact-match keywords). But I’m not so sure about that (more in this case study, if you’re curious). However, even if they don’t impact Quality Score, negative keywords are critical for high ROI because you’re eliminating wasteful spend (clicks from people who aren’t going to buy anything) and re-routing that money to more useful campaigns – all good things. Periodically review your search query reports and set low- or non-converting keywords as negatives. Who cares about CTRs and QS? The whole point of optimizing for these metrics is to increase your conversions in the end! 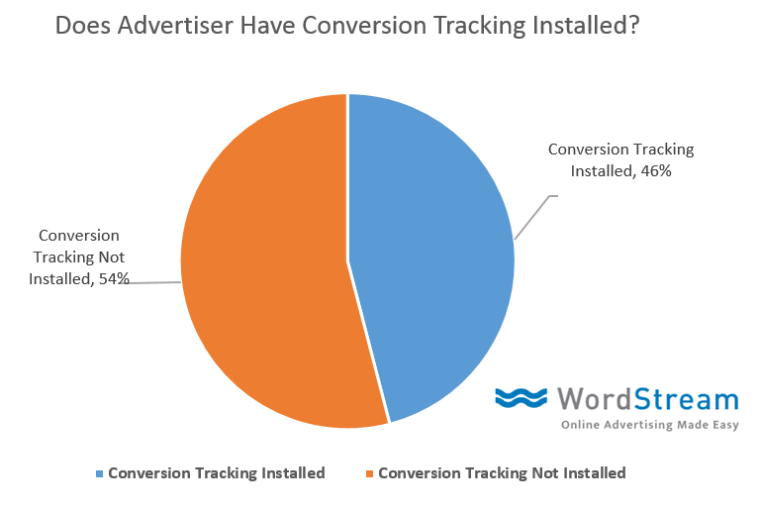 Unfortunately, less than half of small business advertisers have conversion tracking turned on. This makes me sad. Because these advertisers (and we’re talking millions of advertisers, if you extrapolate these results to all the companies using AdWords out there) are kind of missing out of the best feature of direct response marketing: the ability to track results and make optimizations and adjustments based on your data. It’s also why I’ve gone on record saying that Smart Goals aren’t that dumb (for many small businesses). Some form of conversion tracking is better than nothing. 5. What’s a Good Conversion Rate in 2016? Of the approximately 15k accounts that did have conversion tracking on, we found little change in average conversion rates and conversion rate distributions. Whatever you’re selling on the internet, the median conversion rate was 2.9%. Previous studies we’ve done have shown average conversion rates to be in the 2.5-3.5% range. Honestly, I suspect it would be even lower if the 54% of advertisers not using conversion tracking turned conversion tracking on – because businesses that aren’t tracking conversions are probably making a lot of mistakes. Mobile traffic is converting indirectly. The pathways are increasingly indirect – for example, cross-device conversions and calls introduce conversion attribution leakage. This is why call tracking is so important. CRO is basically a ton of BS. One important takeaway is that the top 10% of advertisers (unicorns) continue to crush everyone else with conversion rates 3X higher than the donkeys – they see conversion rates of 8% or more! Reach for the stars. Excellent ad performance – Google is only showing strong performers these days. Low-quality, under-optimized ads won’t even get impressions (especially on mobile). Take advantage of every extra feature you can. Be an early adopter. Write compelling, emotional ads. 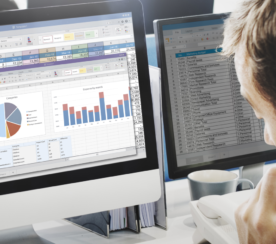 Better measurement – For the love of all that is decent and holy, start tracking conversions. Cut non-converting keywords out of your account. AdWords works incredibly well for businesses that take the time to measure the effects of what they’re doing, so they can funnel more money into the ads that drive the most business value. 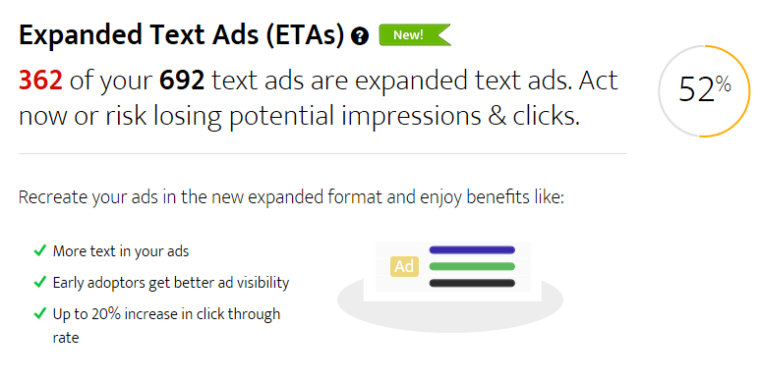 Expanded Text Ads insights – Pretty soon, the old text ads will be turned off completely. You NEED to start writing new ads in the new format, and the earlier, the better because early adopters reap the most benefits. There’s a new section in the Grader that checks your current migration status and provides tips for getting your ads updated ASAP. Screenshot by Larry Kim. Taken September 2016.